Making Headlines: We’re On to Something! It’s been a little more than two years since we first demonstrated the Global Fishing Watch prototype in public, and the media coverage hasn’t stopped. Since launching the prototype we’ve been featured in more than 100 publications on six continents, from the Atlantic, the Wall Street Journal and International Business Times to media outlets in Russia, China, France, Argentina, South Africa, Australia and more. The attention is not only exciting, but extremely encouraging. Our Chief Technology Officer, Paul Woods, puts it this way; “The fact that you have so many people talking about Global Fishing Watch, a product that isn’t even available yet, is an indicator that there is a huge unmet need. There is a need for something that doesn’t exist yet.” In February, 2016, an article in the New York Times Sunday Magazine opened with a cinematic recounting of one particular day in our offices. 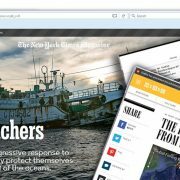 Late on a January 2015 evening in Shepherdstown, W.Va., a data analyst named Bjorn Bergman, surrounded by whiteboards scribbled with computer code, was orchestrating a high-stakes marine police chase halfway around the world.-Palau vs. the Poachers, NY Times Magazine. The methods that we traditionally relied upon (to manage marine reserves) can no longer meet these protection needs, so there currently exists a massive demand for new tools and fresh ideas. . . The Global Fishing Watch prototype looks to be a great tool, and a strong step in the right direction when it comes to ocean information. Large commercial fishers are about to get a new set of overseers: conservationists—and soon the general public—armed with space-based reconnaissance of the global fleet. . . . now environmentalists are using sophisticated technology of their own to peel away that cloak of invisibility. In addition to filling an unmet need, as Paul described, our partnerships with globally recognized leaders Google and Oceana have helped launch us into the headlines at a time of rising awareness and excitement for protecting our ocean resources. In the past three years alone, high-profile celebrities and philanthropic organizations such as Leonardo DiCaprio, Paul Allen, the Packard Foundation and the Walton Family Foundation have collectively contributed tens of millions of dollars to ocean conservation and fisheries management. Political recognition for ocean issues has also gained momentum in recent years. In 2008, the United Nations officially recognized June 8th as World Oceans Day, and in February 2014 by President Obama established of the world’s largest fully protected marine reserve in the central Pacific Ocean. “It’s great to see that people agree with us that this is a big deal,” says Paul, noting that it’s more than just a shot in the spotlight. We know what we’re doing is exciting, and we know it’s important, but a part of what’s so valuable about Global Fishing Watch lies in the crowdsourcing capability. Media attention like this is the best recruitment tool for users who are going to help elevate this platform to become one of the most robust resources for monitoring commercial fishing on the world’s oceans. We’re excited to see that happen. Below is a brief selection of the many articles that have featured Global Fishing Watch. https://skytruth.org/wp-content/uploads/2016/05/MOntage2Bfor2Bwebshortest.jpg 595 1578 Kimbra Cutlip /wp-content/uploads/2016/08/test_logo.png Kimbra Cutlip2016-05-13 13:20:002019-01-23 12:09:34Making Headlines: We're On to Something! The Phoenix Islands Protected Area (PIPA), located in the central Pacific between Hawaii and Australia, is the world’s largest UNESCO World Heritage Site. Spanning a swath of ocean roughly the size of California, its hosts a series of isolated seamounts and almost entirely uninhabited islands, all supporting rich, largely unspoiled ecosystems. On January 1st of 2015, this unique park was officially closed to industrial fishing. But given that the protected area is so huge and isolated, how can we possibly monitor such a park and be sure that that fishing vessels are staying out? In previous posts, we showed how Global Fishing Watch has done exactly that—verifying that most fishing vessels are following the new regulations in the Phoenix Islands. Today, in the prestigious journal Science, members of the Global Fishing Watch team outline in more detail how this monitoring was possible, and we make policy recommendations that will improve our ability to monitor the rest of the world’s oceans. 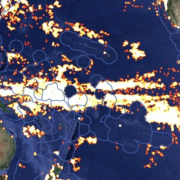 The key technology behind Global Fishing Watch is AIS – the “Automatic Identification System” that almost all large ocean-going vessels are required to carry. AIS transponders broadcast a vessel’s location and identity every few seconds to every few minutes. The system was originally designed as a ship-to-ship collision-avoidance system, but now we can use it to track, via satellite, the movements of large fishing vessels across the globe. In the Science paper we outline the strengths and weaknesses of using AIS to track fishing effort. To get a sense of what we can see using AIS, we created the map below, which shows the movements of all vessels in the world that carry AIS in 2015. 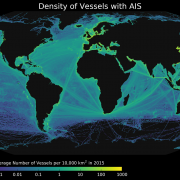 To produce this map we processed four and a half billion data points from over 200,000 vessels. 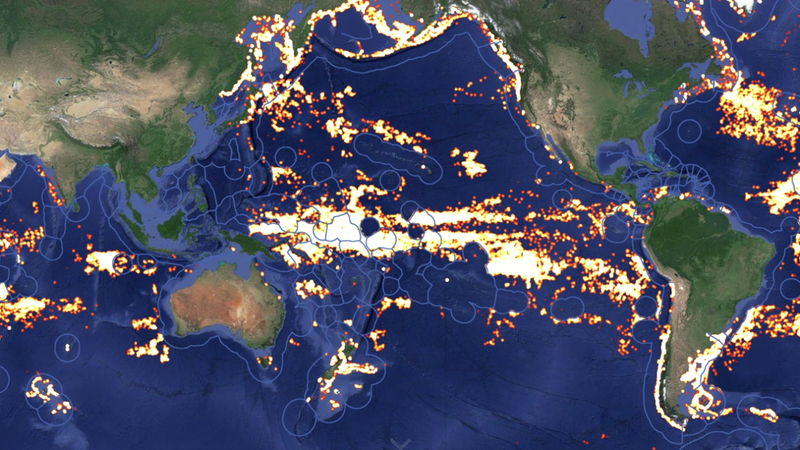 Out of these roughly 200,000 vessels, more than 35,000 are commercial fishing vessels whose movements we can track and analyze. Global Fishing Watch has developed algorithms—and is working to refine these algorithms—that use the movements of fishing vessels to estimate when and where the vessels are placing their hooks and nets. In the paper we show that in the central Pacific, the fishing estimate of our algorithms correlates very well with official, direct observations of fishing. We then used these algorithms to estimate the fishing activity in the Phoenix Islands Protected Area before and after the closure. Below is a video that shows how the fishing vessels cleared out of the marine reserve. The yellow and white heat map shows the intensity of fishing effort as measured by Global Fishing Watch. In 2014, the park was heavily fished; in 2015, there was almost no fishing. Today, also using PIPA as a case study, our partners at Oceana published their own report on the role of Global Fishing Watch in fisheries management and monitoring. As we make clear in the paper, AIS is not perfect. It is used primarily by large vessels, and is thus better for monitoring fishing on the high seas than in small artisanal fisheries. Also, mixed regulations means that in some regions of the world almost all fishing vessels carry AIS, while in others only a few vessels do. 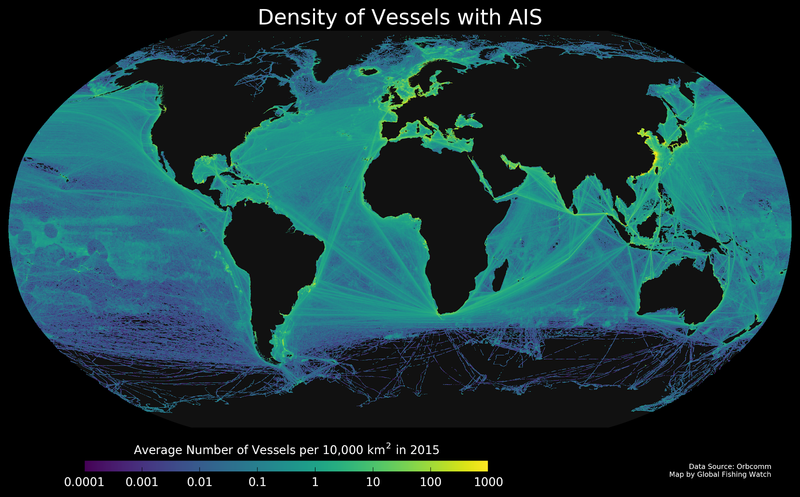 Nonetheless, this technology is an enormous leap forward, and in recent years, more countries are requiring more vessels to carry AIS. As the paper describes, “hide and seek” on the world’s oceans may be coming to an end. 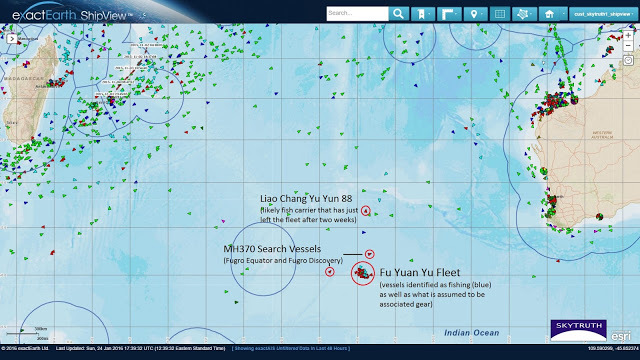 Vessels in the Fu Yuan Yu fleet previously seen near the MH370 search site suddenly disappeared from our monitoring system last week as the entire fleet and associated fishing gear stopped broadcasting AIS. One of the vessels has now reappeared, the Fu Yuan Yu 076 is giving a current location in the Bay of Bengal near India. However looking at the vessel’s track over the past three months there is good reason to be skeptical. While the vessel showed a likely fishing track they appeared in a very unlikely location, the mountains of Tibet. What we see is in fact a latitude reversal where a vessel’s position in the Southern Hemisphere is flipped over the Equator to appear in the Northern Hemisphere. This is one of a number of patterns of false AIS locations we have documented. We’re not sure if these simply result from errors in transmission or if the vessel operator intends to make his vessel difficult to track. Fortunately we have developed some tools to pick these false locations out of our data and correct them. The reappearance today of what is likely a beacon attached to the vessel’s fishing gear (identifying as Fu Yuan Yu 076 08) with a mirror track in the Southern Hemisphere is very strong evidence that this is also the true location of the parent fishing vessel. The vessel’s latest positions show them moving on an irregular course at slow speed so it’s possible that they have resumed fishing at this new location. 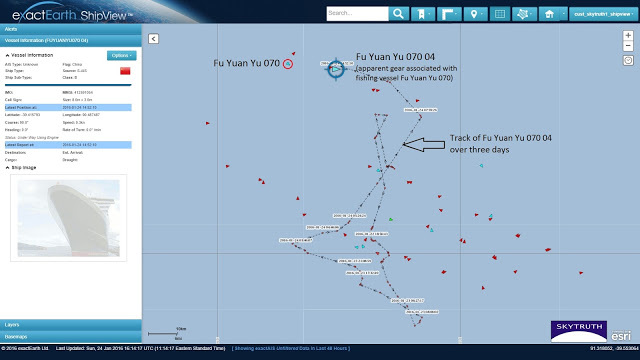 Though we can’t see any of the other vessels in the Fu Yuan Yu fleet there is a good chance they are nearby. We’ll see if any of them reappear in the next few days. 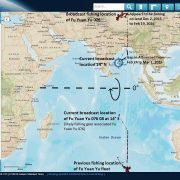 Here are seen two AIS tracks over the past 3 months. 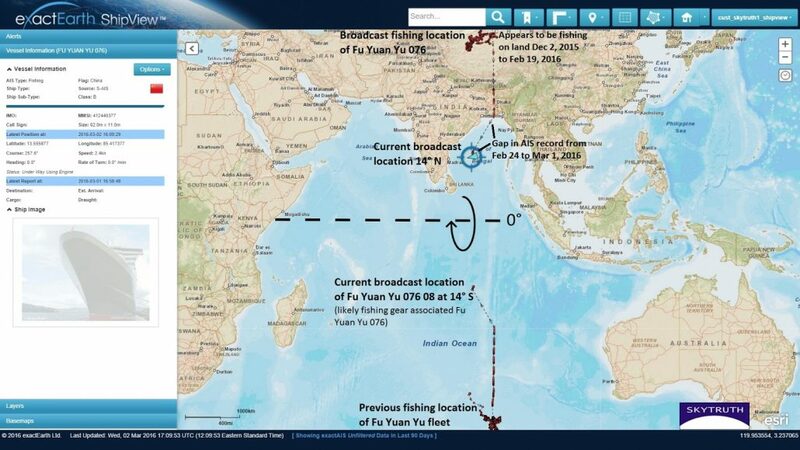 The fishing vessel Fu Yuan Yu 076 broadcasting an impossible location on land in the Northern Hemisphere and the associated Fu Yuan Yu 076 08 (likely fishing gear) mirroring the track but in the Southern Hemisphere. 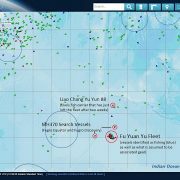 The track of the Fu Yuan Yu 076 08 confirms our suspicion that the true location of the parent vessel can be found by reversing the latitude of their broadcast positions. While none of the other vessels in the fleet can be located it may be that the group has moved north to this new location.